READ THIS CAREFULLY! IT IS CHRISTOLOGY 101. I hope to discuss this after Liturgy this weekend. If a tree is known by its fruit, and a good tree bears good fruit (Mt. 7:17; Lk. 6:44), then is not the Mother of Goodness Itself, She who bore the Eternal Beauty, incomparably more excellent than every good, whether in this world or the world above? Therefore, the coeternal and identical Image of goodness, Preeternal, transcending all being, He Who is the preexisting and good Word of the Father, moved by His unutterable love for mankind and compassion for us, put on our image, that He might reclaim for Himself our nature which had been dragged down to uttermost Hades, so as to renew this corrupted nature and raise it to the heights of Heaven. For this purpose, He had to assume a flesh that was both new and ours, that He might refashion us from out of ourselves. Now He finds a Handmaiden perfectly suited to these needs, the supplier of Her own unsullied nature, the Ever-Virgin now hymned by us, and Whose miraculous Entrance into the Temple, into the Holy of Holies, we now celebrate. God predestined Her before the ages for the salvation and reclaiming of our kind. She was chosen, not just from the crowd, but from the ranks of the chosen of all ages, renowned for piety and understanding, and for their God-pleasing words and deeds. In the beginning, there was one who rose up against us: the author of evil, the serpent, who dragged us into the abyss. Many reasons impelled him to rise up against us, and there are many ways by which he enslaved our nature: envy, rivalry, hatred, injustice, treachery, slyness, etc. In addition to all this, he also has within him the power of bringing death, which he himself engendered, being the first to fall away from true life. The author of evil was jealous of Adam, when he saw him being led from earth to Heaven, from which he was justly cast down. Filled with envy, he pounced upon Adam with a terrible ferocity, and even wished to clothe him with the garb of death. Envy is not only the begetter of hatred, but also of murder, which this truly man-hating serpent brought about in us. For he wanted to be master over the earth-born for the ruin of that which was created in the image and likeness of God. Since he was not bold enough to make a face to face attack, he resorted to cunning and deceit. This truly terrible and malicious plotter pretended to be a friend and useful adviser by assuming the physical form of a serpent, and stealthily took their position. By his God-opposing advice, he instills in man his own death-bearing power, like a venomous poison. If Adam had been sufficiently strong to keep the divine commandment, then he would have shown himself the vanquisher of his enemy, and withstood his deathly attack. But since he voluntarily gave in to sin, he was defeated and was made a sinner. Since he is the root of our race, he has produced us as death-bearing shoots. So, it was necessary for us, if he were to fight back against his defeat and to claim victory, to rid himself of the death-bearing venomous poison in his soul and body, and to absorb life, eternal and indestructible life. It was necessary for us to have a new root for our race, a new Adam, not just one Who would be sinless and invincible, but one Who also would be able to forgive sins and set free from punishment those subject to it. And not only would He have life in Himself, but also the capacity to restore to life, so that He could grant to those who cleave to Him and are related to Him by race both life and the forgiveness of their sins, restoring to life not only those who came after Him, but also those who already had died before Him. Therefore, St. Paul, that great trumpet of the Holy Spirit, exclaims, "the first man Adam was made a living soul, the last Adam was made a quickening spirit" (1 Cor. 15:45). As the slayer of mankind raised himself against us with envy and hatred, so the Source of life was lifted up [on the Cross] because of His immeasurable goodness and love for mankind. He intensely desired the salvation of His creature, i.e., that His creature would be restored by Himself. In contrast to this, the author of evil wanted to bring God’s creature to ruin, and thereby put mankind under his own power, and tyrannically to afflict us. And just as he achieved the conquest and the fall of mankind by means of injustice and cunning, by deceit and his trickery, so has the Liberator brought about the defeat of the author of evil, and the restoration of His own creature with truth, justice and wisdom. It was a deed of perfect justice that our nature, which was voluntarily enslaved and struck down, should again enter the struggle for victory and cast off its voluntary enslavement. Therefore, God deigned to receive our nature from us, hypostatically uniting with it in a marvellous way. But it was impossible to unite that Most High Nature,Whose purity is incomprehensible for human reason, to a sinful nature before it had been purified. Therefore, for the conception and birth of the Bestower of purity, a perfectly spotless and Most Pure Virgin was required. Today we celebrate the memory of those things that contributed, if only once, to the Incarnation. He Who is God by nature, the Co-unoriginate and Coeternal Word and Son of the Transcendent Father, becomes the Son of Man, the Son of the Ever-Virgin. "Jesus Christ the same yesterday and today, and forever" (Heb. 13:8), immutable in His divinity and blameless in His humanity, He alone, as the Prophet Isaiah prophesied, "practiced no iniquity, nor deceit with His lips" (Is. 53: 9). He alone was not brought forth in iniquity, nor was He conceived in sin, in contrast to what the Prophet David says concerning himself and every other man (Ps. 50/51: 5). Even in what He assumes, He is perfectly pure and has no need to be cleansed Himself. But for our sake, He accepted purification, suffering, death and resurrection, that He might transmit them to us. God is born of the spotless and Holy Virgin, or better to say, of the Most Pure and All-Holy Virgin. She is above every fleshly defilement, and even above every impure thought. Her conceiving resulted not from fleshly lust, but by the overshadowing of the Most Holy Spirit. Such desire being utterly alien to Her, it is through prayer and spiritual readiness that She declared to the angel: "Behold the handmaiden of the Lord; be it unto Me according to thy word" (Lk. 1:38), and that She conceived and gave birth. So, in order to render the Virgin worthy of this sublime purpose, God marked this ever-virgin Daughter now praised by us, from before the ages, and from eternity, choosing Her from out of His elect. Turn your attention then, to where this choice began. From the sons of Adam God chose the wondrous Seth, who showed himself a living heaven through his becoming behavior, and through the beauty of his virtues. That is why he was chosen, and from whom the Virgin would blossom as the divinely fitting chariot of God. She was needed to give birth and to summon the earth-born to heavenly sonship. For this reason also all the lineage of Seth were called "sons of God," because from this lineage a son of man would be born the Son of God. The name Seth signifies a rising or resurrection, or more specifically, it signifies the Lord, Who promises and gives immortal life to all who believe in Him. And how precisely exact is this parallel! Seth was born of Eve, as she herself said, in place of Abel, whom Cain killed through jealousy (Gen. 4:25); and Christ, the Son of the Virgin, was born for us in place of Adam, whom the author of evil also killed through jealousy. But Seth did not resurrect Abel, since he was only a foretype of the resurrection. But our Lord Jesus Christ resurrected Adam, since He is the very Life and the Resurrection of the earth-born, for whose sake the descendents of Seth are granted divine adoption through hope, and are called the children of God. It was because of this hope that they were called sons of God, as is evident from the one who was first called so, the successor in the choice.This was Enos, the son of Seth, who as Moses wrote, first hoped to call on the Name of the Lord (Gen. 4:26). In this manner, the choice of the future Mother of God, beginning with the very sons of Adam and proceeding through all the generations of time, through the Providence of God, passes to the Prophet-king David and the successors of his kingdom and lineage. When the chosen time had come, then from the house and posterity of David, Joachim and Anna are chosen by God. Though they were childless, they were by their virtuous life and good disposition the finest of all those descended from the line of David. And when in prayer they besought God to deliver them from their childlessness, and promised to dedicate their child to God from its infancy. By God Himself, the Mother of God was proclaimed and given to them as a child, so that from such virtuous parents the all-virtuous child would be raised. So in this manner, chastity joined with prayer came to fruition by producing the Mother of virginity, giving birth in the flesh to Him Who was born of God the Father before the ages. Now, when Righteous Joachim and Anna saw that they had been granted their wish, and that the divine promise to them was realized in fact, then they on their part, as true lovers of God, hastened to fulfill their vow given to God as soon as the child had been weaned from milk. They have now led this truly sanctified child of God, now the Mother of God, this Virgin into the Temple of God. And She, being filled with Divine gifts even at such a tender age, … She, rather than others, determined what was being done over Her. In Her manner She showed that She was not so much presented into the Temple, but that She Herself entered into the service of God of her own accord, as if she had wings, striving towards this sacred and divine love. She considered it desirable and fitting that she should enter into the Temple and dwell in the Holy of Holies. So it is, and this is why She, from the beginning of time, was chosen from among the chosen. She Who is manifest as the Holy of Holies, Who has a body even purer than the spirits purified by virtue, is capable of receiving … the Hypostatic Word of the Unoriginate Father. Today the Ever-Virgin Mary, like a Treasure of God, is stored in the Holy of Holies, so that in due time, (as it later came to pass) She would serve for the enrichment of, and an ornament for, all the world. Therefore, Christ God also glorifies His Mother, both before birth, and also after birth. We who understand the salvation begun for our sake through the Most Holy Virgin, give Her thanks and praise according to our ability. And truly, if the grateful woman (of whom the Gospel tells us), after hearing the saving words of the Lord, blessed and thanked His Mother, raising her voice above the din of the crowd and saying to Christ, "Blessed is the womb that bore Thee, and the paps Thou hast sucked" (Lk. 11:27), then we who have the words of eternal life written out for us, and not only the words, but also the miracles and the Passion, and the raising of our nature from death, and its ascent from earth to Heaven, and the promise of immortal life and unfailing salvation, then how shall we not unceasingly hymn and bless the Mother of the Author of our Salvation and the Giver of Life, celebrating Her conception and birth, and now Her Entry into the Holy of Holies? Now, brethren, let us remove ourselves from earthly to celestial things. Let us change our path from the flesh to the spirit. Let us change our desire from temporal things to those that endure. Let us scorn fleshly delights, which serve as allurements for the soul and soon pass away. Let us desire spiritual gifts, which remain undiminished. Let us turn our reason and our attention from earthly concerns and raise them to the inaccessable places of Heaven, to the Holy of Holies, where the Mother of God now resides. Therefore, in such manner our songs and prayers to Her will gain entry, and thus through her mediation, we shall be heirs of the everlasting blessings to come, through the grace and love for mankind of Him Who was born of Her for our sake, our Lord Jesus Christ, to Whom be glory, honor and worship, together with His Unoriginate Father and His Coeternal and Life-Creating Spirit, now and ever and unto ages of ages. Amen. I need to fly out the door for liturgy in a few moments, but I wanted to at least share a little about today’s feast now, because I may not be back at the computer for quite a long time today. I hope very much to write more about this feast, because it is one of the wonderful, deeply theological and "quiet" feasts of the year, and we should understand it. I had many ideas last night, after listening to the parables of Vespers and the entire Vigil service (especially the canons at matins, well sung by Reader Nicholas and Natalia Hawthorne), but unfortunately, the ideas in my head have much trouble making it into print when it is late at night. Also, a little about one of the parables of Vespers. On feasts, we have at least three readings at Vespers, usually from the OT. If I get time, I really want to expand on these readings. Ezekiel 43:27-44:4 27 And when these days are expired, it shall be, that upon the eighth day, and so forward, the priests shall make your burnt offerings upon the altar, and your peace offerings; and I will accept you, saith the Lord GOD. 1 Then he brought me back the way of the gate of the outward sanctuary which looketh toward the east; and it was shut. 2 Then said the LORD unto me; This gate shall be shut, it shall not be opened, and no man shall enter in by it; because the LORD, the God of Israel, hath entered in by it, therefore it shall be shut. 3 It is for the prince; the prince, he shall sit in it to eat bread before the LORD; he shall enter by the way of the porch of that gate, and shall go out by the way of the same. 4 Then brought he me the way of the north gate before the house: and I looked, and, behold, the glory of the LORD filled the house of the LORD: and I fell upon my face. 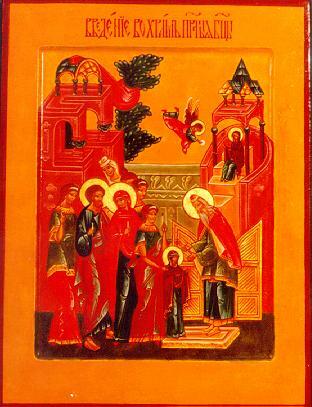 This gate is understood by the church to refer to none other than the Holy Theotokos. Her birth-giving was unique among all of mankind, since she bore the “prince”, and there would never be another such birth, thus the gate was shut. The closed gate also references her ever-virginity; after the birth of Jesus, she has no more children, and did not even have carnal relations with Joseph. The gate faced east because Christ, referred to here as the “LORD, the God of Israel” is the “dayspring from the East”. This is the direction that represents holiness; to this day we situate our altar tables so that when the priest stands before it he faces to the East, and it is the custom to, if it is possible, to have our icon corners face to the East. Our dead are also buried such that they face east, that is, so that if they were to stand up, they would be facing east. In the Second coming, Christ will come from the East. You are currently browsing the archives for the Presentation of the Theotokos category.